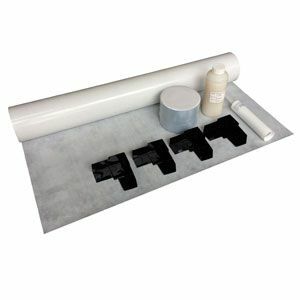 Contour Butyl is a flexible self-adhesive waterproof membrane for tanking Wet Room Floors. It is ideal for substrates such as timber, masonry, concrete, plasterboards, gypsum and existing ceramic and natural stone. 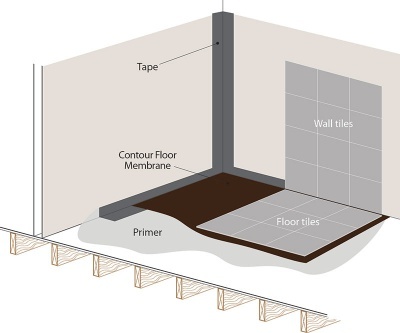 Once applied the Contour floor membrane is ready to tile immediately, however it will take 24 hours to achieve it's full bond strength. Contour membrane is cold applied, consisting of a 1mm thick butyl waterproof layer, incorporating a fleece on one side. It has been developed for use prior to the fixing of ceramic or porcelain tiles and natural stone and is applied using a flexible rapid set adhesive with keys to the fabric. As the adhesive dries it forms a strong bond to the membrane. A pre-formed flexible self-adhesive waterproof membrane. Comes with preformed internal corners. Permanent waterproof bond for use prior to laying tiles onto a wetroom floor. 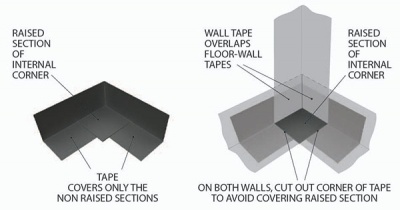 Ideal for use on timber, masonry, concrete, plasterboards, gypsum & existing ceramic or natural stone. Once applied, the membrane is ready to tile immediately. Membrane is cold applied, consisting of a 1mm thick butyl waterproof layer, incorporating a fleece on one side. Can be installed over a thermal board. Heating restricted at 32°. Electrical heating max 150w.